What is Frosted Window Film? Our window film is a thin adhesive vinyl film which has been specially designed to give an appearance of acid etched or sandblasted glass. If you order the film before 4.30 pm, the film is sent out the same day by Next Day Recorded Delivery. What kind of surface is the film suitable for? Any mirror ,glass or perspex window; however, it must be a smooth, clean surface . 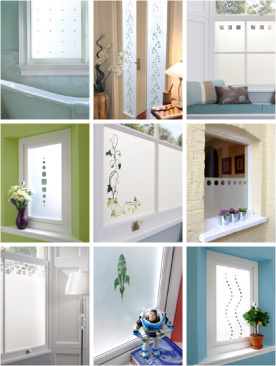 You can't see through the window film; however, you can see through any design cut-outs. Yes, our easy to follow instructions will explain how to use the wet method for a bubble free application. Also; having your window film computer-cut to your exact requirements, enables the film to fit perfectly in place . Yes, just use a damp, lint-free cloth, avoiding any abrasive materials. Yes, you can use the film in a bathroom or shower room, but not where the film would be continually immersed in water (such as the inside of a shower door). Yes, our frosted film can be removed without leaving a sticky residue. Just warm up the film with a hair dryer and peel off. The film we supply is durable and should last for many years, under normal conditions. It is water resistant and will not suffer from exposure to condensation. See our 'Technical Specs' page for full details. Yes, you can 'tweak our designs or send us your own custom designs'.